The Thick-billed Weaver Amblyospiza albifrons is in a monotypic genus (only one species in the genus), namely Amblyospiza, this name meaning "blunt, finch", referring to its amazingly heavy bill. The male has a black bill, white forehead (photo left) and conspicuous white patches in its wings; the rest of its plumage varies racially, from chestnut to black. The sexes are dissimilar, and the female has a yellow bill, brown upperparts, and underparts white heavily striped with sepia. The Thick-billed Weaver was first described in 1831 by Vigors from a specimen from the vicinity of Algoa Bay, Eastern Cape. Read more here about its discovery. It feeds on insects, fruit, and hard-shelled seeds. This species inhabits wetlands when breeding and forest edges when not breeding, and shows some local movements. The Thick-billed Weaver has four subspecies. The nominate is found in southern Africa. 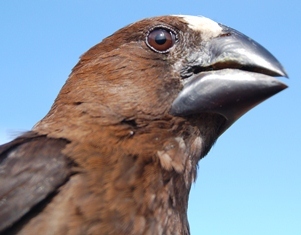 A. albifrons montana occurs from northern Zimbabwe and Botswana to Kenya. A. a. melanota is found from western Kenya to southern Sudan. A. a. capitalba occurs in West Africa to Angola and DR Congo. A map of its distribution in Africa may be viewed at the species summary. 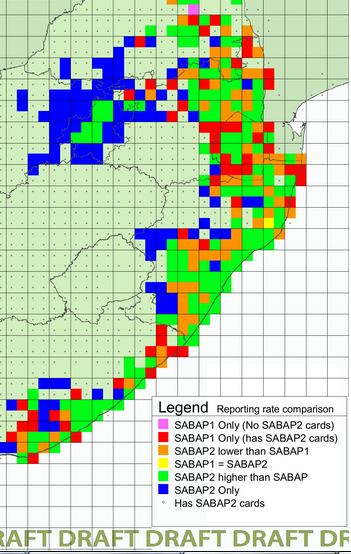 This species is expanding its range, especially in the provinces around Gauteng in South Africa, as shown by the blue grids in the map of the eastern part of South Africa - more detail was provided in a post earlier this year (see here). Photo above: female Thick-billed Weaver investigating a non-breeding nest, phown 2398, by David Gitau in Tanzania. The nest of the Thick-billed Weaver is distinctive. It is compact, woven with thin strips of reeds, slung between upright stems of reeds. The nest is globe-shaped with a side entrance near the top. Initially the entrance is large, and reduced to a narrow opening if used for breeding. Colonies may be small with one male, or larger with several males, in a reed patch. This species is polygynous, the male attempting to attract several females. There are 45 PHOWN records, and 37 of these have nest counts. But many more records are needed. So far there are no PHOWN records from central or West Africa. It is a fairly common species locally although nests may be hard to count in reeds. Please look out for nests of this species (see a species summary here and submit to PHOWN (PHOtos of Weaver Nests) via the Virtual Museum upload site. Of particular interest is colonies from the expanding part of its range - see the PHOWN priority for this species.